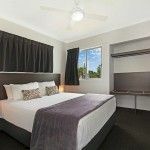 Cooroy Luxury Motel Apartments Noosa offers the business traveller to the Sunshine Coast region the ideal resting place for one night or one month. Whether looking for overnight accommodation while carrying out business in the Sunshine Coast area or needing mid to longer term accommodation in the event of winning a tender our apartments are perfect for either occasion. Each apartment has a separate Southerly facing bedroom as well as a separate living and dining area built to the latest building standards. As a result, you can be assured of a peaceful and uninterrupted nights sleep. The windows are dress with 100% blackout curtains to minimize the effect of the Queensland 4.30am summer sunrises. Each bedroom is also fitted with a three-speed ceiling fan to circulate air throughout the warmer days and evenings along with a remote control split system air conditioner. With off street undercover parking directly at the door of all ground floor units you’ll have peace of mind your vehicle is safe and with most units living areas facing North over the peaceful back street also allows the option of parking directly in front of your apartment to allow a watchful eye from the lounge suite. If our guests decide on dining in all apartments are furnished with crockery and cutlery with our self contained apartments also have the add benefit of double cooktops, range hoods and convection microwaves. 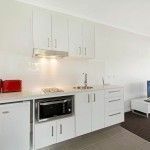 If cooking is best left at home the complex is situated within a five minute walk of numerous local eateries including Indian, Asian, Pizza, Fish and Chips along with The local hotel and RSL offering award-winning dining options. 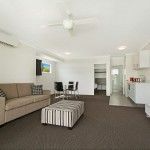 Ring us today to make your Cooroy Corporate accommodation booking at Cooroy luxury motel apartments.